We challenge our students to become men of character by embracing new experiences outside the classroom. Our students experience Catholic Memorial as far more than a school. It becomes a home for life. In late September each year, the Catholic Memorial School community celebrates Olympic Day. An annual rite of bidding farewell to the good weather and bonding with your classmates, this day pits the classes against one another in epic battles of physical, intellectual and strategic maneuvering. Whether it be in volleyball, football, track, hockey, baseball or tug-of-war, everyone's talents are needed to earn their class points and rally for the coveted first place award on Olympic Day. In January, the freshman/sophomore semi-formal takes place in the Ronald Perry Gymnasium. The Semi-Formal offers both a dinner and dance for freshmen and sophomores and their dates. At the Junior/Senior Prom later in May, juniors and seniors celebrate the end of the year with a special dinner and dance hosted at a local ballroom. Each quarter, the Student Activities coordinator organizes a gym night for each class at CM. Students come back to the school for evening basketball games, pizza, and movies. Gym nights are a great chance for all classes to bond and for students to meet new friends outside of the traditional classroom environment. This publication welcomes submissions from all students. This publication is a product of the Journalism class, as well as submissions from students in all grades. CM’s Junior Classical League or Latin Club is very involved in the state & national organization. It competes in the western part of Massachusetts in the annual catapult contest. The Novice Certamen team has competed against other schools in the state. The Knights are always well represented at the State Convention where members earn many prizes in academics and ludi games. The club newspaper is entitled Equites and comes out a few times a year. Visit the Latin Club webpage here! This club is open to students in all grades. The Latin Honor Society inducts several new members each November at an induction ceremony. Required to study Latin for a minimum of two years and maintain a high grade point average in the subject, these students show an earnest desire to revive this dead language in their study of its syntax, history, literature, and culture. Throughout the past year, the Math Club has investigated and discussed many interesting, mathematically oriented topics not normally seen in a classroom setting. Among the topics explored were advanced logic, finite differences, Sudoku, Pythagorean triples, the pigeon-hole principle, and game theory. As a result, all members of the club develop a greater appreciation and understanding of the power and elegance of mathematics. This club is open to students in Grades 7 and 8. This club is open to all students and serves as a platform for students to participate in mock Model UN scenarios. The team competes in various tournaments throughout the year including hosting its own. Meeting Time: 2:30 p.m., Wednesdays, as well as individual practices as competitions one Saturday a month. This team serves as an extension of the Model UN team and is open to students in Grades 7 and 8. Meeting Time: 2:30 p.m. Wednesdays, as well as individual practices and competitions one Saturday per month. This is an extension of the Forensics team, open to student in Grades 7 and 8. FIRST Robotics Competition (FRC) is a unique varsity sport of the mind designed to help high-school-aged students discover how interesting and rewarding the life of engineers and researchers can be. The FIRST Robotics Competition challenges teams of high school students and their mentors to build a robot in a six-week time frame. Teams build robots from scratch and compete with them in local, regional and national competitions. Northeastern College mentors work with CM students in every aspect of building a robot, from design to machining, assembly, electrical layout and programming. Students also get involved in website design, graphic design, photography, video and presentations. The World Language Honor Society requires of its members a commitment to the World Languages curriculum and culture, as well as having a minimum grade point average to be eligible for induction. Along with the National Honor Society, the World Language Honor Society members are inducted in the Spring. This club is open to all students interesting in any and all kinds of writing. The Art Club opens students up to new possibilities they hadn’t dreamed imaginable and rewards artistic students who want to take their talents to the next level. The goals of the club are to use students’ artistic talents for community projects. Highlights of the year included painting nativity figures, painting birdhouses for Habitat for Humanity, and a field trip to the Museum of Fine Arts. Thanks to a dedicated crew of producers and directors, writers, technical support and anchors, CMTV is up and running every day at 7:55am. Under the advising eye of the faculty adviser, CMTV reports not only announcements and sports, but also in-depth coverage of events such as dress down day, fundraisers, missions, and activities. The cameras are rolling on most home games and even important away games, and that means some dedicated member of CMTV is there too. Beginning each morning with a prayer and the pledge of allegiance, CMTV puts CM students in the right frame of mind for the day, but also provides us with an occasional laugh and diversion before school begins. This club is open to students in all grades who play guitar. This club is open to all students interested in photography. This club is open to all students interested on working on the Catholic Memorial Yearbook. The Bowling Club is a great way for CM students to relax and enjoy each other’s company in a competitive or non-competitive setting. With faculty captains scouting out the best places to bowl each year, the bowling club is also a nice alternative for students to burn off the stress of academics in the months when they may be in between sports seasons and still want some spirited practice. With a lively crowd in this club, students are never at a loss for social opportunities! This club is open to students in all grades. This is open to students in all grades and will consist of various intramurals such as Dodgeball, Flag Football, Basketball, and Madden '16. Mastering the slopes is the ski and snowboard club, which goes on several local trips every winter to places like the Blue Hills and Mt. Wachusett. In years past, they have visited Okemo, Stowe, and Waterville Valley. Although not a winter sports “team,” this club gets all the thrills of competition and the speed of downhill racing while having fun at the same time. Each year the club also goes to Killington during February vacation. The weekend trip to Killington is for students in grades 9-12. The day trips are open to those in the 7th and 8th grades. The Board Games Club is open to students in all grades who are looking to play their favorite board games from Settlers of Katan, to Monopoly, to Candyland. The goals of the club are to have fun after school while also meeting new people. 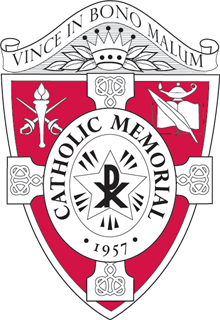 Catholic Memorial is a member of the South Shore Interscholastic Chess League. Competitive matches against other high schools and middle schools are held from November through March. All CM Knights - masters and beginners - are encouraged and welcomed to join our club and come show off their "moves." This club is open to all students in all grades. The CM Bookstore club works hard through the course of a school day, whether it be opening early or staying late, doing inventory or learning the principles of business. The bookstore club comes in on holidays and summer days to prepare for sales or for the coming semester’s book needs. Many students involved in the bookstore club aid in designing and ordering new gear and apparel that makes us proud to be CM Knights. This club is an elected group of Middle School students serve in both Donahue Hall's Student Government and Campus Ministry. The National Honor Society, or “NHS,” inducts new members in the fall who showed a commitment to service, character, scholarship, and leadership over the course of their first three years at CM. The seniors in the club demonstrate much leadership in organizing holiday gift drives, clothing drives, and the annual Blood Drive co-sponsored by the Red Cross. Membership to the NHS is gained by application only, based on nationally recognized criteria. The Students Against Destructive Decisions (SADD) program is committed to raising awareness and educating its peers on the effects of destructive decisions. It is charged with the mission to provide safe and healthy activities and experiences to CM students, showing the community that there are alternatives to using drugs and alcohol. Each year the SADD program helps organize the Big Wishes Program, which is the Holiday gift drive that takes place in the Lower School. Big Wishes raises several thousand dollars in gifts that are donated to the Home for Little Wanderers. The club also instituted the “Quiet Zones” studying program during mid-term and final exams offering students a quiet and relaxing place to study. The program also releases a montly newsletter, iChoose. SGA representatives and officers in all grades coordinate with the National Honor Society and Campus Ministry to organize charity and mission work, tutoring, and field trips to curricular and extra-curricular sites. They also meet frequently with the school administration to evaluate and implement existing or potential policies and procedures as they concern students’ well being in school each day. This is an elected group of officers and representatives from grades 9-12.